I wrestled from 7th grade until my first year in college. I competed in Paralympic Powerlifting from 2007 to 2012. Then I did my first bodybuilding show in 2015. I've learned more things through these experiences than I could put into words. But some of the most important things these experiences have taught me is the importance of unrelenting work ethic, having a high expectation of yourself, and having an unrealistic belief in yourself. If you only believe what the world says is realistic for you, I guarantee you won't come anywhere close to your full potential. You will remain mediocre like the rest of the world because you believed the opinions of the world. Dream big and don't be afraid to fail. I would rather look back on my life and see a million failures at accomplishing big things than look back and see nothing because I was too afraid to fail. 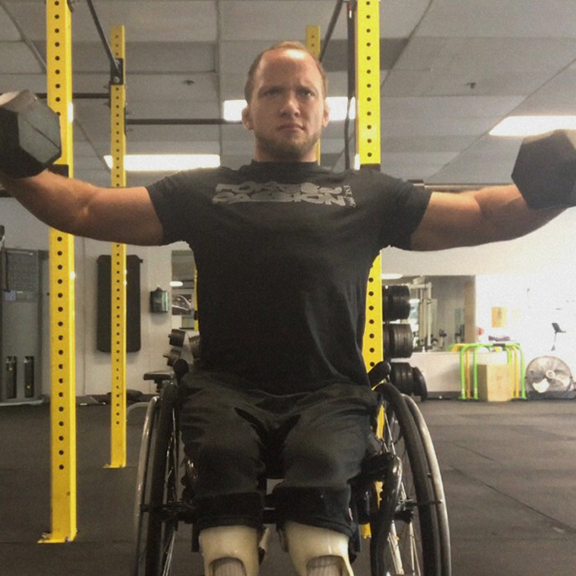 Tyler currently runs Tyler Brey Personal Training at New Fire Fitness in Roseville CA where he helps clients of all ages and fitness levels meet their goals. 2010 Paralympic Powerlifting World Team Member. 2011 Paralympic Powerlifting Parapan American Team Member. 2015 NPC Men's Novice and Men's Lightweight National Champion in wheelchair bodybuilding. 2018 competed in the “Fight To Win Pro 58” as the very first paraplegic. Current brown belt in Brazilian Jiu Jitsu. 2018 took 1st in middle weight and overall in NPC Wheelchair Nationals Bodybuilding Contest in FL winning his IFBB Pro Card.